Before our modern containers, various sized barrels were used for a variety of products both solid and liquid. Coopers, being very skilled craftsmen, also made pitchers, buckets, churns, vats, tubs, and staves with hoops of ash, iron or steel. It took many years to become skilled at the various stages and a good craftsman could make up to six large barrels a day. 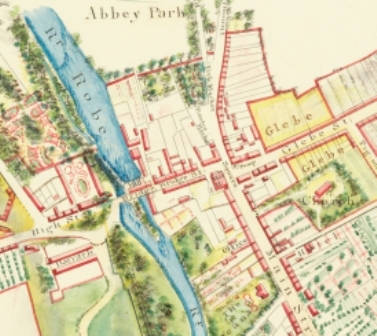 Their workshops were to be found in Ballinrobe with some close to the breweries, which were along the Robe River; the oldest one being on Brewery Lane at the bottom of Bridge Street, where some of the old buildings have been renovated. The barrel’s shapes allowed them to hold liquid securely as hoops could be driven down the barrel until they held the staves tightly. 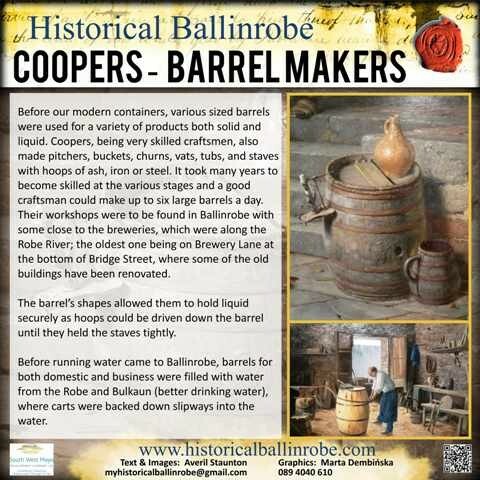 Before running water came to Ballinrobe, barrels for both domestic and business were filled with water from the Robe and Bulkaun (better drinking water), where carts were backed down slipways into the water. This page was added by Averil Staunton on 06/03/2014.